A citizen of the Republic of Poland, Starosta of Wolomin County Kazimierz Rakowski has been removed from blacklist, Azerbaijan`s Foreign Ministry said in a message. Rakowski addressed a letter to the Ministry of Foreign Affairs asking for his removal from the “List of foreign citizens who illegally visited the occupied territories of the Republic of Azerbaijan”. 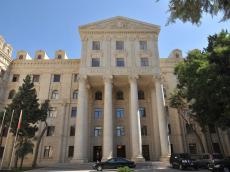 In his letter Rakowski reaffirming his full respect to the territorial integrity and sovereignty of the Republic of Azerbaijan within its internationally recognized borders, its laws and regulations, expressed his apology to the government and people of Azerbaijan for an unauthorized visit to the occupied territories of Azerbaijan. After considering the appeal by the Polish citizen, the Ministry of Foreign Affairs decided to remove his name from the list.